Blog Tour Day 5!! And a REVIEW! Today marks day 5 of my 10 day blog tour. Are you sick me yet? You shouldn’t be…I’m giving away a $25 Amazon.com gift card to one lucky winner and it could be you… Just saying. Stop by todays tour spot. I’m at Words of Wisdom From the Scarf Princess chatting about exotic locales in books. 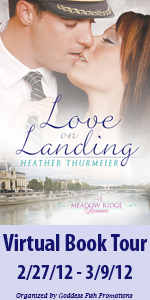 AND she also gave me a lovely REVIEW OF LOVE ON LANDING. You should check that out too!